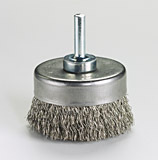 Cup brushes are used for removal of scale, rust, and paint, as well as for deburring and polishing. Different duty levels and fill materials are available to suit a wide variety of tasks in surface preparation, burr removal, and finishing operations. Utility Cup Brushes: Designed for removing light deposits of scale, paint, rust and small burrs. Standard models available in carbon steel, stainless steel, brass, and nylon. Brushes are available with ¼” shank or ½” arbor hole. Approximate trim length is ¾”. Recommended maximum safe free speed ranges from 8,000 rpm to 10,500 rpm. Diameter options include 1¾”, 2″ and 2 ¾”. Minigrinder Cup Brushes: Designed for higher speed rotation in a high speed angle grinder. Suitable for deburring, weld cleaning, paint and rust removal, and surface preparation. Available standard with carbon steel, stainless steel, brass, or bronze wire in both crimped and twisted knot styles. A variety of common threaded arbor hole sizes is available including popular Metric sizes to fit all brands of grinders. Recommended maximum safe free speed is 12,500 rpm. Diameter is 2 ¾”, and trim length varies by model from ¾” to 7/8″. Standard Duty Cup Brushes: Designed for removing scale, rust, and paint and other surface preparation including deburring and polishing. Larger format allows coverage of large surface areas. Standard fill materials include carbon steel, stainless steel, brass, and bronze wire, plus abrasive nylon, nylon, and treated or untreated tampico fiber. A 5/8″-11 threaded arbor hole is standard. Other fill materials and arbor hole sizes are available on special order. Recommended maximum safe free speed ranges from 6,000 rpm to 9,000 rpm. Diameters include 3”, 4″, 5″ and 6″. Bridle-banded: reduces flare for faster cutting action. Bands can be removed as wire wears. Brush fill options include carbon steel and stainless steel, or for non-sparking applications, brass or bronze wire. Safe free speeds range from 6,000 rpm to 7,000 rpm. Diameters include 3″, 4″ and 6″. Bridled cup brushes 4″ and 6″ only. Cup brushes can be filled with any of our selection of materials: steel wire, stainless steel wire, brass wire, bronze wire, or other more specialized wire types, nylon 6-6 or 6-12, abrasive nylon, conductive nylon, polypropylene, polyester, polyethylene, horsehair, tampico fiber, and other materials on request.